A clinic nurse evaluates that a client’s levothyroxine (Synthroid®) dose is too low when which findings are noted? SELECT ALL THAT APPLY. Levothyroxine is used in treating hypothyroidism. Symptoms of hypothyroidism appear if the dose is too low and include decreased sweating, apathy and fatigue, paresthesias, and slowed mental processes. Increased appetite and fine tremors are signs of hyperthyroidism and can indicate the dose is too high. Levothyroxine sodium and liothyronine sodium can be administered orally or IV. Oral absorption rates range from 30% to 65%. 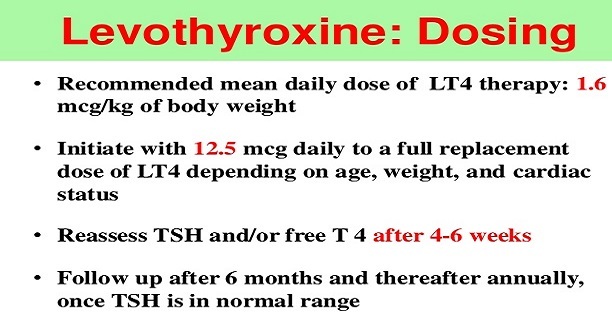 Levothyroxine sodium is preferred to liothyronine because it has better oral absorption, has a longer t1/2, and produces a favorable T4:T3 ratio.